To ensure customer satisfaction through innovative solutions applied by a highly responsive and professional staff that will provide a superior level of quality performance to meet and exceed each customer’s requirements. It is our philosophy that success is built on a key ingredient…Commitment! In this light, we are committed to three key areas…our customers, our employees, and our partners. We take great pride in helping our customers with the accomplishment of their mission.With the majority of our personnel being prior military, we recognize the importance and significance of this role. Fulfillment of our mission statement is enhanced by empowering our employees to not only provide quality service, but to enhance their contributions through fresh, creative, “out of the box” thinking while meeting and exceeding set standards and requirements. We recognize that the lifeline of this company is our employees and retaining them is one of our top priorities. Therefore, Szanca Solutions is constantly looking at ways to improve the quality of life, and pay and benefits for our employees. We are continuously looking for cost effective ways to provide benefits comparable to the larger corporations yet, at the same time, keeping our costs within reason so that we can provide quality personnel to our customers at a cost effective price. 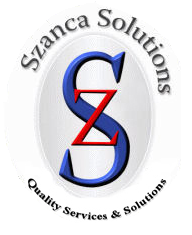 We have taken great efforts to maintain a personal touch with each and every employee and to ensure that they are getting the Szanca Solutions staff support necessary to allow them to focus on supporting the customer. Although the company was started with a prime contract, we also fulfill a subcontractor role on many of our other contracts. Thus, we fully appreciate the importance and differences in being a good Prime Contractor and being a good Subcontractor. In our Prime Contractor role, we have reinvested resources into our infrastructure so that we can be a responsive prime contractor who keeps its partners in the loop and ensures that subcontractor invoices are paid in a quick and efficient manner. We take great strides to ensure that our subcontractor teammates are treated the way we would expect to be treated in a similar role. In our role as a subcontractor, we are very responsive to prime contractor requirements and take great pride in providing a selection of highly qualified candidates to fill each and every mission need in support of our prime contractors and our mutual customers.